Tawaraya Sotatsu is big painter of the early modern times, unknown many points in their lifetime compared to the height of its popularity, it is estimated that born of the 1570s. Fujin Raijin figure screen (Wind God and Thunder God Screens) is in a folding screen that gold leaf is affixed to one side, the appearance of Fujin that alight while puppet-style ride to black cloud from the right side, the figure of thunder that clang a strong thunder drum from left it has been transmitted from ancient times as a masterpiece of Sotatsu Tawaraya depicting. Gilt folding screen one side eye-catching luxury while a plane and decorative, feel to those who watch the cosmic three-dimensional space with hidden infinity on the screen. 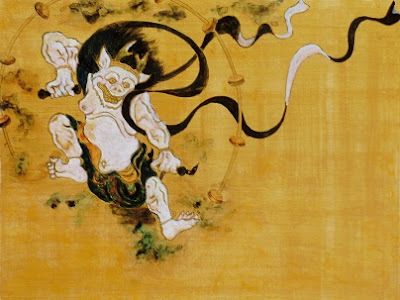 In addition, the representation of the black cloud that ride of Fujin-Raijin, which is considered to have been painted using a technique Tarashikomi by Gindei and the ink is full of mass feeling, even more emphasize the sense of space by gold leaf. It is a very creative even at that time in the representation of the Fujin-Raijin, that drew white feel the harmony and symmetry of the figure of God paired with (Thunder) in green (Fujin) was excellent and exceptionally painter In addition it is a sign of color sense, gleefully alight Does God look like gives a strong impression on those who watch. Cut only the thunder from this large folding screen picture, moreover, tried to replicate is reduced to drawing paper of the F6 size. Of course, it is not used at all like Japanese painting of material Japanese paper and gold leaf, I tried to write in paints acrylic gouache on drawing paper. However, the atmosphere of the original story and I think that was drawn is not impaired.